Our family was one of thousands in Latin America, caught in the far flung net cast by U.S. authorities seeking “the enemy” during World War II. My father, Werner Gurcke, and his brother, Karl Oskar, lived through World War I as children in Hamburg, Germany. Costa Rica was their chosen country— a place to be free and happy, to work hard and get ahead. It was supposed to be a place where war would not touch them again. I learned part of this story from my mother, who, in her 80’s, consented to let me interview her. Her memories were so painful it took over a month of visits, recording her recollections in fragments, a sentence at a time. My father never talked about any of it. He had had to face not only the destruction of his own way of life, but also the distress of knowing his parents and youngest brother were living through another war in Germany. After his death, I found he had saved numerous letters and governmental papers, tucked in a shabby manila folder, at the back of an old filing cabinet in the garage. In the 1920’s, Karl Oskar moved to Costa Rica and married a native woman, Paulina Carlotta Vargas, known as Pany, and gained a stepdaughter, Hermida Jinesta. 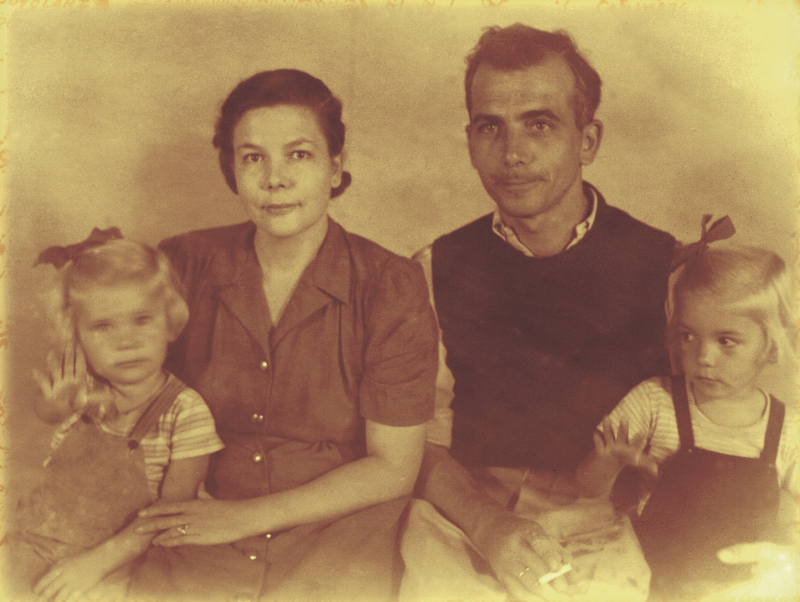 My father, who arrived in Costa Rica in 1929, married my mother, Starr Pait, an American, in 1936. They made their home in San José, where my sister and I were born. My sister, Ingrid, was born July 17, 1941, the same day that the U.S. President, in Proclamation 2497, declared some people to be on “The Proclaimed List of Certain Blocked Nationals.” Werner and Karl Oskar were listed, as was Starr. This U.S. Blacklist destroyed what was left of my father’s business. By February their mail was being routinely censored. A censor reported the following excerpt from a letter Starr wrote to a friend; “Right now he’s [Werner] the chief cause of all my worry. He’s still with me, thank God, but I can’t help wondering for how long. A short time ago, 38 Germans, supposedly those belonging to the Nazi party here, were deported very quietly and suddenly. … A large concentration camp is being built here too; for whom is the big question. We’ve done all we can think of to help — gone to the American consul — I’m still an American, and have written to the Government, stating our innocence of any conspiring against it. Werner has to have a special permit to travel, that is, to go from here to town or to friends out of town, etc. Now there’s talk about our having to give up our radio and camera, which would be a shame but which we’d gladly do if that were all that would happen to us. And all that time they were afraid. They had no idea what to expect next, and neither the Costa Rican nor the U.S. officials would tell them anything. Each denied any responsibility for the situation, pointing, instead, to the other government. On July 4, 1942, Karl Oskar, Werner’s brother, was arrested and jailed along with many other German men. Werner was placed on house arrest. On the 15th Werner was arrested and taken to the local jail, where he, his brother and the other men were kept until being moved to the new “concentration camp” about a week later. There was no bedding, so my mother somehow wrestled a mattress into — and out of — their little Opel for him. In December 1942 my mother, sister and I were picked up by the Costa Rican police and taken to the German Club in San José, which was used as a holding facility for the wives and children of the men in the concentration camp. My Tía Pany and Hermida were also there. No preparations were made for us. Starr was able to hire a horse and cart to have a baby crib delivered the next day, but she and most of the women slept, as best they could, on the floor, taking what comfort they could in having their children beside them. Sanitary facilities were overwhelmed. Diapers were washed out in the swimming pool. The women were kept at the Club for about a week and then sent home, because, according to rumors, a ship that was to take us away hadn’t arrived. A few days before Christmas, much to everyone’s surprise, the German men, all those “dangerous” alien enemies, were furloughed from prison to spend Christmas with their families. By then they’d been given word that we were all being deported. My mother had been able to find out from a sympathetic Costa Rican policeman that we were to be taken to the U.S. We had a week to prepare for departure. On January 2, 1943 my father went back to prison, while my mother finished packing. A week or so later we were again picked up and taken to the German Club, where we waited another week under indescribable sanitary conditions. Children, including my sister and me, developed conjunctivitis (“pink eye”) and runny noses. Around January 20 we women and children were herded onto a train, with the men, late at night so we would not be seen, and taken to Puntarenas, the Pacific port, where officials gave the children canned milk, the first food in the long trip. Most of us, already queasy from the trip, vomited it immediately. For a week the ship sat in port, in blackout conditions. For a week, until the ship sailed on January 26, no one was allowed on deck. No portholes could be opened. It was hot and humid, and soon the air reeked of dirty diapers and old sweat. Most of the children, including my sister and me were sick by now, feverish and fussy. Diarrhea and stomach upsets were common. Diapers had to be washed by hand, then hung around the cabin to dry. Cabins were inspected, and once a sailor would not allow any of us up on deck because diapers cluttered the cabin. Mom was furious about that. Where were they expected to hang diapers? She stopped diapering us at night. I can imagine her, lying on those mattresses, damp with her children’s urine, then trying to bundle them up somehow, so we could move around the cabin in the daytime. By the time the Puebla landed at the Immigration Detention Station, Terminal Island, San Pedro, California, (7:00 A.M. on February 6), many more children were fevered and coughing. The faces, hands and arms of many children and some adults had blistering sores, crusted with thick yellow exudate. Both Ingrid and I were very sick. Mom was also coughing. She did not remember any medical help being offered. The men were taken away, no one knew where. In San Pedro, my mother was interrogated by Immigration and Naturalization Service (INS) officials and the FBI. All deportees were also brought before an INS Board of Special Inquiry. That hearing had one point only. “These proceedings are for the purpose of determining your right to enter the United States,” according to the official Board record. (Italics added.) No legal representation was allowed. After a week of interrogations and hearings designed to “prove” that we Latin Americans were entering the country illegally, thereby allowing indefinite detention, we were put on a bus and driven to a railroad station. Identification numbers, pinned on baggage tags which listed name and destination, were handed out to be tied to clothing. 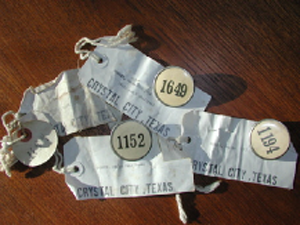 Our tags read Crystal City, Texas. At the station, we boarded a train and began the trip. The windows were dirty; no one could see out or see in. Many of the children were now coughing so hard they had trouble catching their breath. Some of us began vomiting on the train as well, the result of the illness which had begun in Puntarenas. After two days and one night, we arrived in Crystal City, where a bus picked up our sick, exhausted families. We were driven through town, by the statue of Popeye that the City fathers had erected outside the courthouse to mark their town as the “Spinach Center of the World,” and into the barbed wire enclosure of the camp. Our arrival is noted in camp records: February 12, 1943 at 3:00 P.M. There was a huge wire fence opposite our little house, with armed guards in watchtowers and brilliant lights at night, blocking out most views of the stars and casting shadows through the curtains my mother made for our bedroom. In July Werner and Karl Oskar learned that Hamburg had been bombed repeatedly. Hamburg was reported to be almost completely destroyed and an estimated 30-50,000 civilians killed. Months later they received a Red Cross message saying that their parents and youngest brother had survived. My uncle must have been active in camp life while interned. But he, with others, preferred freedom to indefinite detention, even if it meant being sent to a war torn country. Karl Oskar applied for repatriation to Germany for himself and his family as soon as it was offered. His request was granted, and he and his Costa Rican wife and daughter joined a group of German Americans and Latin Americans to be repatriated from Crystal City, sailing on the Gripsholm, February 11, 1944. It was many difficult years later before he and his family were able to return to Costa Rica. He also belonged to a local mutual benefit society, the Unterstutzungverein, founded by Germans in Costa Rica in the early 1920’s. It was completely non-political. Before the war Werner had contributed about 5 colones ($1.00) to another group, the Winterhilfe (Winter Help), a benefit for Germans in need of assistance. Evidently some of the money collected by that organization was used to fund Nazi Party work in Latin America. He had a list of addresses from around the world, confiscated during an FBI raid on his office. The addresses were all business related, as FBI agents noted. We went to Santa Cruz, California, to my mother’s family beach house in May 1944. My mother and her family were well known in the small community of Seabright, and we were treated with kindness and respect. Ingrid and I thought our new home was a palace. We had no memories of upholstered furniture or private toilets. In Crystal City, our house’s inside furnishings, other than beds, were four wooden dining chairs, a table, and one wooden outdoor lounge chair. The toilet and bath facilities had been shared. Since we were still not allowed a camera, neighbors took family pictures for us. We took long, long walks. My father, in particular, couldn’t get enough of freedom, walking as far as he could, as often as he could. Because he spoke fluent Spanish, he found work immediately, supplying groceries to Mexican labor camps. There were still upheavals and constant uncertainty; in August 1944 and again in April 1945 his draft classification was changed to IA. Yes, my “most dangerous enemy” father had to register for the U.S. draft, even while imprisoned! Ramón Fernández, his boss, intervened both times. He was able to convince the Board that Werner’s work was essential to the war efforts, and Werner’s draft classification was changed to II A. In January of 1945 we were suddenly ordered to move from the coast, an order rescinded without explanation several weeks later. In February 1946 my father received word that his alien enemy status was lifted, on the same day that he was issued an arrest warrant for entering the U.S. illegally, with threatened repatriation to Germany. In 1946, too, Werner received a letter from his mother, the first news of his family since 1943. The news was terrible. Ülrich, Werner’s youngest brother, finally conscripted into the military, though sickly, was killed when a hand grenade exploded during training exercises, in February 1945. He was twenty five. Werner’s father, too, was dead, less than a month after Üllie and just two months before Germany’s surrender. Max refused to eat after Üllie’s death, and had died “of a broken heart.” Karl Oskar and his family were as well as could be expected, as was his mother, Frieda.